In animal studies, BPA has been linked to a variety of prevalent diseases, many of which are increasing in the United States and are taking a major toll on our collective health. 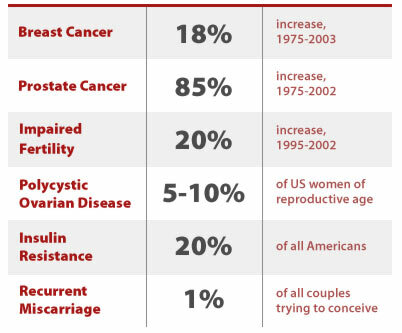 These include breast and prostate cancer, obesity, and infertility. The United States is noted to have one of the highest incidence rates for breast and prostate cancers in the world; lifetime risk for these cancers has steadily risen over the last two decades and currently stands at 1 in 8 for breast cancer in women and 1 in 6 for prostate cancer in men. In addition, obesity is also on the rise in the US and is regarded to be an epidemic by public health experts. More couples are also reporting difficulties with infertility, with a recent CDC study finding a 20% increase in the last decade in the number of couples who report having difficulty conceiving. What is most worrisome about these animal studies is that the doses of BPA that are being used are extremely low and in the range of the levels that have been found in people. In other words, the levels of BPA that are being found in people have been linked in animal studies with serious medical conditions that affect the health and wellbeing of millions. BPA concentrations are expressed in parts per billion (ppb) by weight (micrograms of BPA per kilogram of food).